Are you looking for a grind and brew coffee maker for your daily cup of coffee? Any coffee lover out there would agree that there is nothing better than the freshest cup of coffee early in the morning (or whenever the heart wants it). In order to ensure that freshness remains an integral part of your coffee, many coffee machine manufacturers have started creating models that can grind the coffee beans and then make a perfect cup of coffee after brewing the ground coffee. After doing a thorough study about the best coffee makers and coffee grinders, a thought came of combining the both. And so, the idea of creating this list came up. Since there are many options in the market and it can become tough to pick the best, here is our list of Grind & Brew coffee makers that are suitable to pacify your ‘guilt-free’ addiction of coffee. Even though the market is filled with low-cost combination coffee makers and grinders, Cuisinart DGB 9000BC has the traits that make it worthy of your attention. 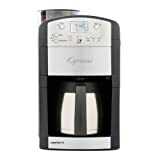 There is no denying that Cuisinart has been producing premium-quality grind and coffee makers for years now and they have truly won many hearts ever since they introduced a much improved Cuisinart DGB900BC – a burr grind and brew thermal coffeemaker that amazingly combines standard drip coffeemaker and a burr grinder in one simple device. It is programmable and boasts a thermal carafe that ensures coffee keeps warm even for hours. The sleek and stylish design of DGB 9000BC gives a classic look. Setting up the machine is easy because the control panel is simple and easy to comprehend. The controls easily allow you to program the grinding schedule up to 24 hours in advance. There is a release lever that can be pulled to remove the permanent GoldTone filter. The easy removal makes cleaning the device convenient for the user. Overall, a bit extra cleaning and maintenance is needed for this machine. If you are one of those people who like to grind their own coffee beans, then this machine is perfect for you. The machine is easy to use and delivers more than expected results. If you think that brewing awesome-tasting, freshly ground coffee is never easy then it is time to change your perception. The reason behind it is simple: Cuisinart DGB700BC. 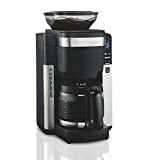 This 12-cup automatic coffee maker has a special burr grinder that impeccably grinds the beans moments before brewing a heavenly-tasting cup of coffee for you. It is fully programmable and comes with a brew-pause function, auto-shutoff, 8-ounce bean hopper etc. The machine has a rather simple interface and a design. Overall, it is an average looking machine that can be setup quite easily. The programmable brewing is not complicated and all it requires from you to set pour grinds and filter in advance. But there is no denying that this machine has the traits to take care of almost everything for you. Cleaning Cuisinart DGB700BC requires a bit cautious approach, especially when you are cleaning clinging grinds. It is because moisture can be the reason behind making the grinds to clump and collect in the chute. This machine has what it takes to make your morning routine easy and stress-free. Don’t let the price fool you because it is a robust mid-range brewer that provides utmost freshness, taste, aroma, and convenience to the user. Overall, it is a fantastic choice for anyone who loves to brew auto drip and convenience. Inarguably, a perfect cup of coffee in the morning is exactly what everyone needs to kick the laziness out of the body. Making a perfect cup of coffee is not rocket science but it isn’t a walk in the park as well. There is a need for the right amount of water, flawless brewing, and captivating aroma and of course, the amazing flavor that we all love. If you look around, you’ll find only a handful of coffee makers that are deemed as the best in the coffee making business. And if a list of Cuisinart coffee makers is being made, it will be incomplete without Cuisinart DGB650BC. Setting up the machine is quite convenient and users find it quite simple to program the machine at a predefined time to grind the beans etc. The digital control panel and automatic brewing save up a lot of time and it is worth mentioning here that it has a 24-hour programmable function. Cuisinart DGB650BC comes with an instruction booklet that simplifies the whole process of cleaning and maintenance. However, it is important to keep in mind that this machine does require frequent cleaning if not daily. It is a coffee maker that is within the price range of many and one cannot neglect the fact that it impeccably balances both quality and style. Many users find it super easy to use and praise its all-around performance. All in all, if you are looking for a small, affordable coffee maker that gets the job done then it is one of the best options at your disposal. If you are looking for a single serve coffee machine with grinder that seamlessly brews one great tasting cup of fresh ground and brewed coffee then Cuisinart DGB-1 is just the right choice for you. It is super easy to use because the independent blade grinder automatically grinds whole bean coffee and dispenses it into the coffee filter basket – it is as easy as it seems. Overall, this single serve machine has all the traits to fully satisfy your coffee addiction. It has the capacity of grinding and brewing 16 oz. When it comes to setting up this machine, it is probably the easier thing ever. All you have to do is to plug the machine and simply follow three steps: you add beans, water and press the ‘ground and brew’ button – even novices can operate this machine with fair ease. The drip tray of the machine can be removed quite easily to accommodate a travel mug. Thanks to the removable drip tray, cleaning the machine is quite easy. Given the fact that it can easily brew coffee in three simple steps, how can someone not fall in love with it? It is perfect for someone who does not drink a ton of coffee but is looking for just an amazing cup of coffee early in the morning or after a hectic day. Overall, it is the best grind and brew single cup coffee maker that comes at a reasonable price range. How often have you come across a coffee maker that not only delivers unmatched taste but also looks as sophisticated as George Clooney? Black N Decker Mill N Brew is not only known for providing rich taste but also for its classy look. It can easily convert your favorite whole coffee beans into ‘rich in taste’ strong or mild cup. With the already integrated QuickTouch programming control panel, you can control the strength of brew or set the timing for the auto brew as per your convenience. It is fully programmable and setting it is easy just like it is with other coffee makers in the market. The digital control panel makes it simpler for the user to operate the machine. The carafe and removable brew basket is dishwasher safe and cleaning the machine hardly consumes your time. All you have to do is remove the all-in-grinder and permanent filter and simply wash it in the sink. The machine can easily brew multiple cups of coffee with fair ease and favorite coffee beans can be ground by a simple touch of a button. On top of all this, the digital control gives you the power to customize the settings as per your taste and preferences. All in all, it is a great machine that delivers great tasting coffee every single time. 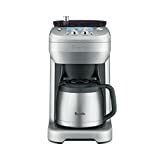 With Breville BDC650BSS, you can grind your coffee beans in the way you like and get an instant delicious brew that is simply out of this world. Thanks to six different grind setting, you can grind about ½ pound of beans with the adjustable grinder. This coffee maker has a programmable ‘autostart’ feature that ensures you get a great cup of coffee early in the morning. In short, it is the answer to all your early morning coffee making problems. All the machine needs is few initial startups and it is good to go. Simply plug the machine and pour coffee beans in its hopper. Press brew button and get a great cup of coffee within no time. Cleaning and maintenance of the machine is rather easy and all it requires is brushing out few crevices. And removable drip tray makes cleaning less time-consuming. However, the machine needs to be maintained for better use. In the end, it all comes down to how the coffee taste and thankfully, the coffee that comes out of this machine taste great. Some users might find it a bit complicated but a user manual is quite helpful because each instruction is explained in detail. Overall, it is a good machine that delivers a perfect cup of coffee every time when you desperately need one. If you are looking for a coffee maker that seamlessly combines grinding and brewing functions, Capresso 465 is the one you need to be looking at. Don’t let this tiny machine confuse you because there is more to it than just the size: a strong conical burr grinder that does a great job along with a good brew. One of the best aspects of the conical burr grinder of this coffee maker is that it turns coffee beans into unvaryingly shaped grounds within no time. You can set brew setting as per your choice and the stainless steel thermal carafe ensures that no reheating is required for hours. Overall, it is a small machine that with big, impressive functions. Capresso 465 is not a complicated machine and setting it up is quite hassle-free. Thanks to the easy-to-read LCD display, you can get the idea of what you are doing and what needs to be done. The LCD displays shows brew strength setting, grind and time. You can easily clean the grinder channel by looking at the detectable see-through cover that gives a clear idea of when the machine needs some cleaning. Even the permanent GoldFilter is quite easy to clean. Overall, cleaning the machine is not time-consuming but it is best to clean it on frequent basis. You can easily adjust the grinder to achieve the taste you like (there are 5 fineness settings). The charcoal water filter is quite effective in removing about 82% of chlorine from water and other impurities. However, it is recommended to use filtered water to make your favorite cup of coffee. The conical burr grinder is surely one of the main reasons this machine is highly recommended. The brew is great and when it comes to taste, it is prodigious as well. So, it is definitely a machine that you can have without any doubt in your mind. If you are one of those avid coffee lovers who just cannot spend a single day without drinking coffee, then you need to use Krups KM7005 Grind and Brew. Apart from the amazing taste, another attraction of this coffee maker is its design that can easily compliment any modern kitchen. It can easily produce 10 cups of coffee with fair ease. Needless to say, the manufactures of this coffee maker have surely emphasized a lot on technology and quality. It is programmable and this means that it can easily be set to automatic brew at any given moment. Users have highly praised it for the convenience it provides and that is why it is widely regarded as one of the best grind & brew coffee makers in the market. When it comes to cleaning, the machine requires minimal cleaning after every use and it is only because some grounded beans tend to stick to the grinder. So, in order to ensure that next batch of coffee remains unspoiled, it is best to clean it after every use. The machine has made it much easier to make delicious cups of coffee without going through any trouble at all. One thing can be said with absolute confidence that this machine provides satisfactory results every single time. It is affordable and provides the taste that you desire the most. What else do you need? Let’s face it, life is hectic and we don’t have time to enjoy little things. For instance, you wake up in the morning and you are running short on time and you just cannot wait for the coffee to brew because time is ticking. Gourmia GCM4700 is the answer to your time problems because the machine enables you to program brewing timing at night. This means that you’ll have a hot piping cup of coffee ready when you want it to be ready. Without compromising on quality, Gourmia ensures that you get to enjoy little things in life. The machine comes with a manual that explains the whole process of setting up the machine and cleaning it. However, it is not that difficult to setup the machine as it is programmable and it is easy to comprehend the control panel. The basket design of the machine ensures that the user can easily clean the machine. 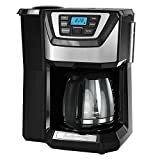 Many users found this coffee maker extremely helpful and convenient because of its feature that allows the user to set the timer for desired time. Overall, it is a perfect coffee maker that is perfect for anyone who is either too lazy in the mornings or always running late. Ever wished of having a coffee maker that does the entire job for you and all you have to do to enjoy the delicious cup of coffee sip by sip? 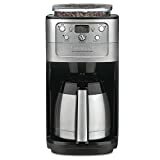 Well, Hamilton Beach 45400 does all that for you by simply dispensing pre-ground coffee into the brew basket. All you have to do is add water and select the number of scoops and that’s pretty much it. Overall, it is a smart coffee maker that even remembers how many scoops of coffee are required to get you the desired strength and taste. In a nutshell, it will automatically do the job for you and make you a cup of coffee just the way you like. Setting up Hamilton Beach 45400 is quite easy as all you have to do is to put coffee grounds in the container, select number of scoops you want, choose the strength of your coffee and press the brew button – it is as simple as that. Cleaning the machine takes no time as well because the intelligent sensor lets you know when it is time to clean the basket. There is also optional clean cycle reminder that alerts you when the machine needs some cleaning. Overall, the machine is designed in such a way that cleaning is quite minimal. 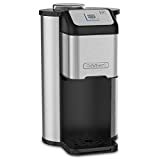 If you are one of those people who just cannot compromise on taste and are afraid to ask someone else to make a cup of coffee for them, this coffee maker is the best choice, no questions asked. The reason why it is highly recommended is that it makes coffee just the way you like by memorizing the number of scoops, strength of coffee etc. Needless to say if you are conscious about how your coffee needs to taste, waste no time in acquiring this coffee maker. Although Grind and Brew coffee makers are true space-saving units, there are still some factors to consider before deciding to buy one. A true coffee enthusiast is always trying to choose freshly ground beans over pre-ground beans. After all, there has to be absolutely no compromise on taste, aroma, and quality of the coffee. If you love directly grind and freshly brewed coffee and does not worry much about the hassle, grind and brew coffee is all that you need. When it comes to buying a grind and brew coffee maker that meets your needs, it is best to have a proper understanding of things before making a purchase. So, let’s get started. Given that everyone wants their coffee ground according to their preference, these coffee makers come with different grind settings. The availability of this feature enables the user to create either a thick coffee or the one with a smooth taste. There are machines that can give you 20 to 60+ grind settings – choose the one that suits your needs. You choose the machine with the low or high-capacity grind, it all depends on how much coffee you would like to consume. Some people prefer high grinding capacity because they do not want to go through the hassle of grinding coffee beans every time they brew a pot of coffee. The grinding capacity of these machines can vary from making 4 to 14 cups of coffee in one go. Look for the grind and brew coffee maker that has different areas where you can easily grind coffee. For instance, there can be a filter basket or you can pour directly into the portafilter. This feature enables you to adapt grinding of your coffee according to the needs of the machine. While buying a grind and brew coffee maker one of the important factors to consider is the Programmability. There is no denying a programmable machine provides convenience to the user. For instance, if you feel lazy in the morning to get up early and make a cup of coffee, you can choose a machine that comes with a 24-hour programming feature – it brews your coffee before you wake up. Another programming feature to consider is the Auto-Shutoff. People often forget to turn off the machine at night which leads to more energy consumption and increased electricity bills. A machine with auto-shutoff feature ensures there are no accidental brews, spill, excessive electricity bills or even short circuit. You should look for machines that can Brew a small volume of coffee as well. It is a suitable feature for those who like to enjoy a single cup of the morning and do not want to brew an entire pot of coffee. Another feature to look for is the Brew-Pause function that enables the user to break the brewing process and enjoy mild-brewed coffee. Choosing thermal carafe or hot plate depends on how you like your coffee. It is because thermal carafe is best known for keeping the coffee hot and fresh for hours and hot plate is not quite recommended to people who like to drink their coffee hours after it is brewed. The thermal carafe is insulated and this means that there is no need of a hot plate to keep the coffee warm. One of the main reasons why the hot plate is not the best options is that it gives the coffee a burnt taste. Given that a glass carafe sits on a hot plate for hours, it will stay hot but the taste will start to change as well, the taste will become more acidic. Therefore, it is best to consider grind and brew coffee maker that comes with a thermal carafe. You can choose glass carafe if you like to drink freshly brewed coffee and not the one that sits on the hot plate for hours. You can find coffee makers that can serve over 14 cups in a single go and then there are machines that can serve up to 4-6 cups. Choosing the right machine depends on how much coffee you consume in one sitting or if there is more than one person in the house who drinks coffee. However, most machines have an average serving of 12-14 cups. You can get a good grind and brew coffee maker for less than $50 and the premium ones for over $250. While the features may vary from one coffee maker to another, price does play a role as the expensive ones come with more enhanced and quality-providing features. If you’re into quality and more convenience, look for some high-end models. If you’re experimenting, it is best to buy a reasonably priced coffee maker before investing in a more expensive one. Regardless of what you choose, one thing can be said with certainty that grind and brew coffee makers are the best at providing freshly brewed coffee with aromatic and rich taste.